Pioneer India Is India’S Leading Company Providing A Range Of Roofing Sandwich PUF Panel. These Are Made Out Of Polyurethane Foam (Puf) Sandwiched Between Layers Of Waterproof And Non-Corrosive Material. These Are Designed Using Latest Technology Thus Serving With Best Performance Even In Extreme Weather Conditions. These Pre-Fabricated Roofing Panels Are Designed To Withstand The Quirks Of Nature And The Vagaries Of Time. 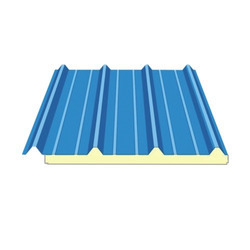 Pioneer India Is Offering Sandwich Roofing Panels, Sandwich Roofing Panels India, Roofing Panels In India, Prefabricated Roofing Panels Being The Leading Sandwich Roofing Panels Manufacturers, Roofing Panels Manufacturers. Looking for PUF Sandwich Panel ?